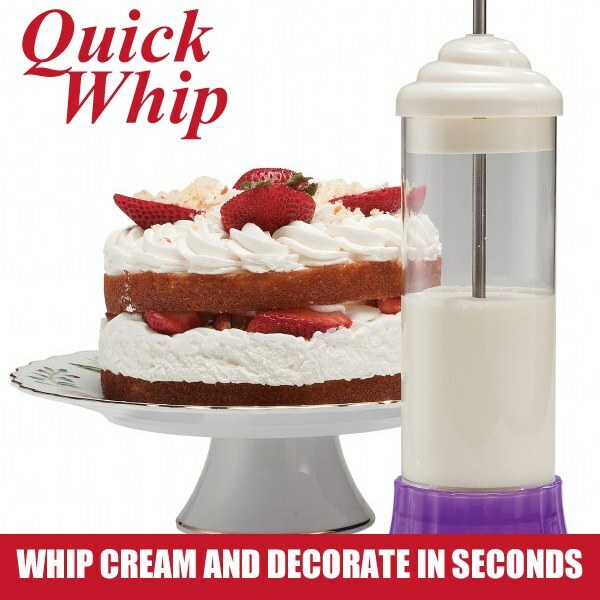 The Hutzler Quick Whip makes thick whipped cream in just 60 seconds! Just pour in heavy whipping cream, add some flavoring if you like, pump the handle for 60 seconds and serve. Then simply attach one of the included decorating nozzles to quickly and easily decorate a cake or dessert. Quick Whip - whip cream and milk frother. 5 Decorating Nozzles: 1 round tip, 2 star tips, 1 ribbon tip and 1 long filler tip. Holding Stand with tip storage.